Are you familiar with the payout winch? It's junkyard technology, literally. The WINCH itself goes down the road, on a flat trailer or in a pick-up truck. With a towing trailer, every vehicle with a trailer hitch receiver can be a tow vehicle for you. The winch (reel) has a disk brake, to pull the glider up, and to pay out the tow-line (with a preset tension), as the glider climbs. You can tow hang gliders to several thousand feet AGL (plenty of altitude for thermal soaring), using Spectra or Dyneema tow-line. An electric motor (car starter) can reel in the tow line after the pilot releases. 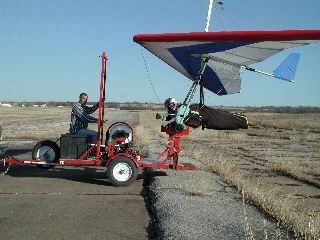 With a small drogue 'chute on the towline, the motor can retrieve the tow line, before it even touches the dirt. Towing is a Special Skill, so find experienced HG tow pilots to give you all the important details. These experienced types can also advise you about the best parts to get, for your towing rig. This page was last modified on 28 March 2012, at 21:22.